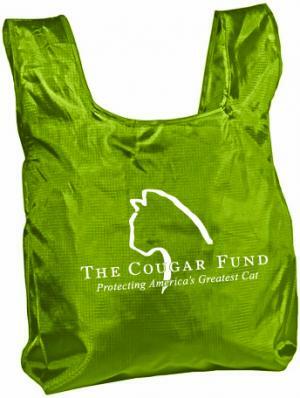 The Cougar Fund ECO tote bag is made from reusable rip stop nylon that folds into itself for easy storage and carrying. Our bag is a high quality, ultra-lightweight, compact reusable shopping bag that is practical and attractive – final folded size is a mere 5″ x 6″ size. Fits over supermarket checkout bag frames for ease of use in stores! Available in Moss Green. © 2019 The Cougar Fund.